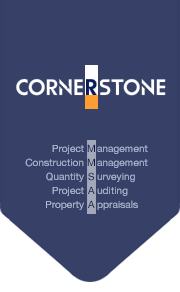 Cornerstone (formerly Gleeds, an International Management and Construction Consultancy) was formed in 2004 and has 70 staff comprising Project Managers, Quantity Surveyors, Engineers, Architects and Surveyors. As Cornerstone, we have maintained a significant position in the Thailand construction market place, principally by producing high quality work and advice on a repeat basis, for many major Clients. Cornerstone is a totally independent organization, with no ties to other firms or practices. We are also a Royal Institution of Chartered Surveyor(R.I.C.S) Regulated Firm since 2012 R.I.C.S is professional body from United Kingdom ( U.K.) that accredits professionals and firms within the land property and construction sectord wordwide to maintain the highest professional standards.